We chose Pacifica Senior Living Calaroga Terrace because they offered us care for my dialysis and they offered us help for when I needed help because I don't need it all the time. The apartment is lovely, but the bathrooms are not handicap accessible, and they are very difficult to function in. There's not enough storage or drawers. The bathrooms are not big enough for a wheelchair. It's very difficult because I'm not in a wheelchair, but I need a lot of support, and I'm not getting it in the bathroom. They have lectures, movies, bingo, card games, and entertainment. The food is not very good. The selection is very poor. They do not tell you they have special hours (like for breakfast). They tell you they have breakfast all day, and then when you go to get it, it's not available. The service is the worst I've ever had in my life. We sometimes wait almost an hour just to be served. Pacifica Calaroga Terrace is quite lovely. I'm sure many people would be happy there. It's wonderful. It's a great experience. The service is excellent; I couldn't ask for more. The rooms are great; they have views. They have everything. I think it's great for senior living. My mom has tried the food and she enjoyed it. They have activities. Seniors were playing games, they were working in a store, and they were sewing. There was a lot of diversity, a lot of care, and a lot of love when I was there. My father stayed at Pacifica Senior Living Calaroga Terrace. Initially, it was really good. I liked the location, which was a lot closer to me than where he is now, and the studio apartments. The food was better compared to what he is having now, and there were more options. Calaroga seemed to have the best number of features to offer. It's unfortunate that my dad needed to move to assisted living. I thought that the staff at Calaroga was very nice and helpful. It had gotten poor reviews under a previous ownership and didn't do very well before, but they're now owned by Pacific Senior Living and doing a lot of renovation. I think the staff managing it now are doing a fine job from what I can determine. I think it's fine, not perfect but good. Calaroga Terrace is being totally remodeled and upgraded. Their amenities seemed to be typical. They have a large dining room. The staff was very nice and accommodating. Pacifica Senior Living Calaroga Terrace and its staff was OK. I had an OK one-bedroom studio. The dining room was fine, and the food was good. They had a lot of activities, but I did not participate in them. The best way to get to know a community is by scheduling a tour. See the facilities, meet the staff and residents, and get a feel first hand what it's like to live at Pacifica Senior Living Calaroga Terrace Assisted Living. A luxurious, 17-story high-rise, Pacifica Senior Living Calaroga Terrace sits in the heart of the Lloyd District in Portland. Offering a variety of living options, we have accommodations that fit any budget or personal lifestyle. Our community has such a wide range of amenities and services, we are like a small town within the city. Pacifica Senior Living Calaroga Terrace adheres to the same core values of accountability, integrity, life enrichment, teamwork and professionalism that all our locations do. Founded in 1978, Pacifica Senior Living fully supports the communities, residents and the families we serve with the utmost care and compassion. The small-town feel at Pacifica Senior Living Calaroga Terrace comes in part from the many convenient amenities we provide on site, including a bank, well-stocked grocery store, auditorium and post office. 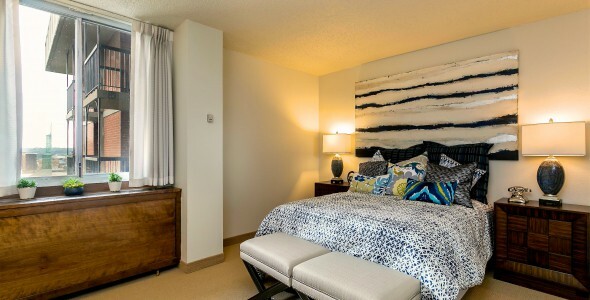 Our accommodations are available in studio, one- and two-bedroom apartments that feature individually controlled heating and cooling, cable television, private baths and stunning views of Portland. All meals are chef-prepared and served in our community dining room three times a day. Secured parking is available on location. Fun and engaging activities are regularly scheduled throughout the week and include live entertainment, exercise classes, musical activities and more. When a resident is in need of an extra helping hand, our Health Director creates a personalized care plan that is tailored to fit his or her specific needs. Assistance with dressing, grooming, medication management and other daily tasks is available. All residences at Pacifica Senior Living Calaroga Terrace receive weekly housekeeping services, while assisted living residents receive linen services, which alleviates the hassle of household chores. Convenient beauty salon and barber services are available in the comfort of our community, and scheduled transportation is provided in one of our comfy buses. Pacifica Senior Living Calaroga Terrace has a wide selection of amenities and services to offer individuals looking for independent living or assisted living accommodations.